Borderlands is a gamer's game. Devoid of any high-minded pretensions of offering a story, rich characterizations or original design, the game instead plunders the well of the most battle-tested formulas to produce a game that is surprisingly better than the sum of its parts. Borderlands also shines as a case study in genre mash-ups. Developer, Gearbox Software, combines two of our most enduring genres -- the role-playing game and first-person shooters -- to amazing effect. Hybrids all too often fall flat in their balancing act, neglecting one genre while over-salting the other. I'm happy to report that Borderlands sidesteps most of these pitfalls, paying fair tribute to both shooter and RPG fans alike. To ice the cake even further, they've seemingly managed the impossible task this generation, which is to say competently offer seamless drop-in or four-player co-op. The shock! Players take on the role of one of 4 selectable vault hunters dispatched onto the desolate colony world of Pandora, to seek out the fabled Vault which is home to mysterious alien technology of unspeakable power. Each character is distinct and represents a player class all their own. Roland is your standard soldier grunt; Mordecai is the classic sniper; Brick provides the requisite tank-meathead; and Lilith is the stealthy assassin. The fearsome foursome is pushed towards their goal by a remote, Cortana-like personality who occasionally pipes into your ear to relay long-term objectives or to offer generic encouragements. The existence of classes is your first major clue of the game's RPG inspirations. The 4 playable characters are distinct in their look and character progression trees but they all share a common foundation when it comes to their proficiency in weapons. And in Pandora, the weapon of choice is almost always a gun. In fact you're given your first gun shortly after beginning the game's tutorial. Guided along by a uni-wheeled talking robot called a Claptrap, the tutorial gently introduces you to the harsh lands of Pandora, a post-apocalyptic kind of place that takes far more stylistic cues from Mad Max than Fallout 3. From there on out, it's up to you to explore the world and pick up the pieces that will unlock your path to the Vault. Pandora is laid out as a series of interconnected hub worlds, with each one containing a balanced mix of supply depots, towns, quest givers and hostile territories. Borderlands has flashes of feeling like an open-world environment, but is fairly linear. Unlocked areas can always be revisited to finish quests or to beat up on weaker foes but the player is quite rigidly corralled from beginning point to end-game battle. 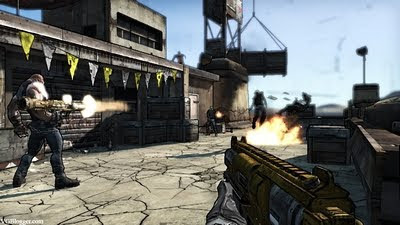 Borderlands is first and foremost a shooter. Pandora as a world is a very rich backdrop for the first-person shooting action but as a role-playing game, it falls well short of being an interesting place to be. You're supposed to be more interested in the basic trappings of an RPG: leveling, obtaining new items, customizing your character's class skills and the like. In this respect, the game strikes a fairly good balance of offering enough variety and depth without slowing the pace with minutiae or number-crunching. But it's the loot game that makes Borderlands such an addicting experience and helps draw the inevitable comparisons to Diablo. There always seems to be a better gun, shield upgrade or class-boosting artifact just around the corner and it's this sick compulsion that drives deep into any gamer's pleasure center and takes firm hold for the good 20-25 hours it takes to complete the main story quest. As lovely as all the loot is, you are constantly awash in items. Equipment chests are scattered everywhere. Lockers contain loot, as do toilets, safes and refrigerators. Even skag vomit (a skag is the Pandora equivalent of a giant rat) holds some ammo scraps after you've picked through it. It's loot, loot all the time and it eventually gets wearying and becomes a form of visual white noise. You'll pick up a couple choice weapons that serve you well, relegating most of your loot drops to your junk pile or as merchant fodder. In a way it reminds me of Sacred 2 another loot-heavy game I reviewed earlier this year. It's as if the game is desperately afraid of losing your interest, ever so vigilant it is at dangling another shiny trinket in your face or sending you on another tiresome errand disguised as something more meaningful. The enemies could also have been imbued with a sense of variety. Outside of a few notable boss characters, your enemies boil down to a small mix of deranged bandits and various scurrying creatures that simply charge at you, AI sophistication be damned. Quest givers and other friendly NPCs fare no better. They are pure cardboard cut-outs, not even so much as emoting when you come into their vicinity. But hey, they only serve one purpose and that is to dole out missions for you to complete for more experience, money and loot. If that were all there was to Borderlands, I'm afraid it would be just a very average game. Thankfully, the entire package is kicked up several notches by the very capable first-person shooting mechanics, the striking art direction and the nearly seamless 4-player co-op feature. A few RPGs have attempted FPS controls in the past, most notably Fallout 3 and Deus Ex, but no one has really captured the visceral feeling of firing a big gun in the context of a stat-driven RPG system. Borderlands comes the closest to nailing this perfectly. Firing guns feels right and to appease the RPG nuts, each successful hit elicits damage numbers that float up from your target, so you know exactly how awesome your new electricity-spewing shotgun is. There's still a slight disconnect during combat especially when you're pumping clip after clip into higher level enemies, but you rarely feel like your FPS skills are getting the short end of the stick. Now I've heaped quite a few criticism onto Borderlands already but in all honesty, most of these niggles fade far into the background once you've grouped up with 3 other friends to tackle the wastelands together. With scaled up enemies and loot, the moment-to-moment enjoyment factor ramps up considerably when you have a group working as a team. A lot of techniques common to MMOs come into play here, with mixed class tactics being one of more satisfying results. Even many skills that seem a bit pointless in solo play take on a new life when you combine them with the complementary skills of another class. Co-op is not perfect, since it's possible for greedy players to make off with the best loot and it renders the already paper-thin narrative to the distant background even more than when playing alone. Lag also rears its ugly head on occasion. It's best played using dedicated character with the same group of friends, that way you're all at the same level and moving through the world at the same pace. In the end, Borderlands does occupy that uneasy position that hybrids usually do. While it does a solid job as both a shooter and RPG, it's not even close to giving the champions in each of those genres a run for their money. And during a busy holiday season that sees the release of Call of Duty: Modern Warfare 2 and Dragon Age: Origins, you almost have to wonder if Borderlands has enough mojo to compete. But compete it does. The co-op is what really gives Borderlands its legs. Overall, I found the game to be quite the paradox, equally unique and derivative, addictive yet frustrating. It's something that is bound to hold your interest for at least 15 hours, and for many players, that's as good a recommendation as they'll ever need.